Eliminate the time delay in safety report submission and fix serious problems immediately. Close the gaps in your safety reporting system with FieldFocus. Assign company safety forms to employees mobile devices. No more lost forms, no more end-of-month rush to submit late reports. Review safety reports immediately after submission and make changes swiftly to improve workplace safety. Use your mobile device to complete inspection reports and submit to the office in real-time. Build custom inspection reports with checklists, drop down menus, photos, signatures and GPS tags. Export all of your reports into a spreadsheet to see the complete history and track/analyze the data. Save data entry time, paper filing and storage costs. Get field information in real time to ensure continuous internal, or government compliance. Build digital compliance forms for field compliance. Export, or archive, efficiently and rapidly. Create custom data collection forms for compliance information. Save time spent waiting for emloyees to deliver compliance documents. Instantly receive compliance information, including photos, as employees send via mobile device. Improve productivity and efficiency with mobile timesheet submission. Employees can complete and submit their timesheets from anywhere with internet or cellular service. Build custom timesheet forms with as much detail as you need- vacation time, sick time, hours assigned to specific contracts or customers. Verify employee presence on the job site with GPS location tags or pictures. Require on-screen signatures for job site verification. Submit timesheets directly from mobile device to manager or accounting department. Gain valuable job insight with custom progress forms. Build a different form for each job and track workflow, costs, and progress. Use FieldFocus dashboard to view project metrics and schedule resources. Create custom forms to track progress, time spent at each job, issues and other information needed to ensure job success. Duplicate and rename your forms for each job to easily keep track of multiple jobs. Export job reports to Excel or .csv to track progress of each job. View job site visitors and contractor traffic with real time access and gate logs. Build forms with entry and exit times and any other information needed to meet protocol. Easy interface for gate guards to track vehicles and personnel on a job site. Easily document in and out traffic with vehicle license tags, drivers names, occupants in the vehicle, equipment brought to the site and other important information. Export access/gate logs into PDF reports for digital distribution. Every company’s checklists are different. 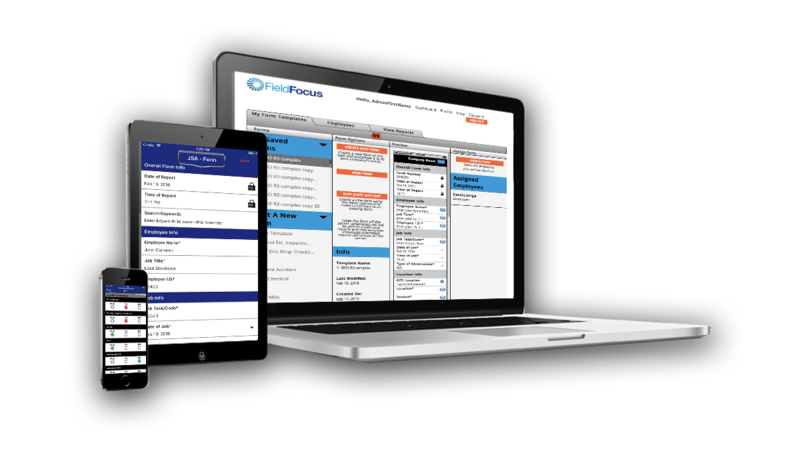 FieldFocus provides customization capability to make the checklist that fits your needs. Whether it’s restaurant inventory, equipment maintenance, safety compliance, or something else, being able to configure your checklist leads to a quicker, more accurate way of capturing and sharing that information. Create checklists for opening, and closing, of restaurants or other venues. Ensure all cleaning, safety, and inventory tasks are completed before your staff goes home. Use checklists to keep track of equipment maintenance. Assign custom checklists to staff as a precautionary step in maintaining the life of your expensive assets and avoiding downtime. Keep track of inventory and stay ahead on ordering with checklists. Request quantities from field staff to know when to order more. Manage your valuable assets with custom maintenance checklists for buildings, vehicles or equipment. Rapidly review maintenance reports and respond quickly to save money and prevent downtime. Track maintenance schedules, allowing you to plan for deployment of other assets and keep your project on track. Create custom maintenance checklists, with photographs, for your facilities for quicker response and repair times. Capture internal maintenance issues on a mobile device and send directly to the correct repair person with detailed information about the problem. Use FieldFocus’ 18-wheeler truck inspections to quickly capture info for repairs or for completing pre-inspections. Vehicle pre and post checklists. Keep your vehicles in safe condition. Know who had the vehicle and when to help track damages that has occured on your vehicles. With up to 75 different reporting fields for up to 75 unique sections, you can create a report that fully aligns with your company’s needs. FieldFocus is a customizable solution that works for you. We don’t tell you how to run your business – we give you a valuable tool to help you run your business your way. Register Today To Get Started. Be Up and Running in Minutes! FieldFocus was created to efficiently collect reports from the field in real time. To help you improve communication, increasing accountability, save time and money.